Plunge into the world of fairy tale! Feel like a king walking with your dog! 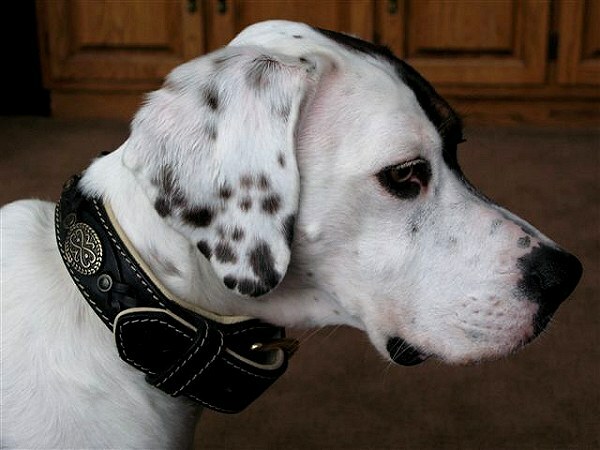 This Fabulous Leather Dog Collar decorates your dog’s neck in a very delicate way and what is more important assists in better control of your four-feet friend. 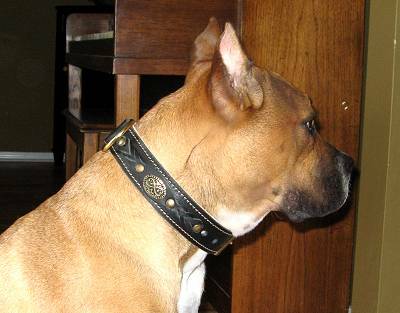 This handmade leather collar is your choice! Please your dog with a new comfortable gear! 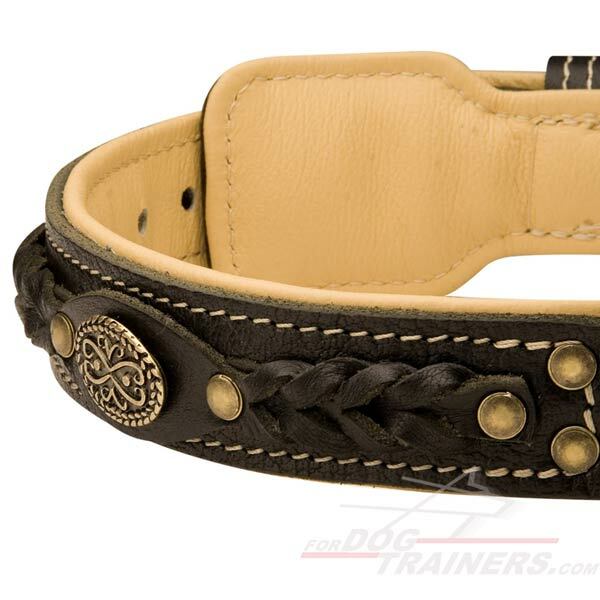 This collar is an excellent combination of style, quality and maximal simplicity. Manufactured fully of leather, it is a flexible and soft dog control tool. 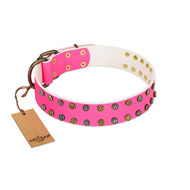 If you are going for a walk, beware of sun because this collar will shine like a diamond! Excellent palette of black surface, light padding and gold decorations - king’s style! Your dog deserves it! 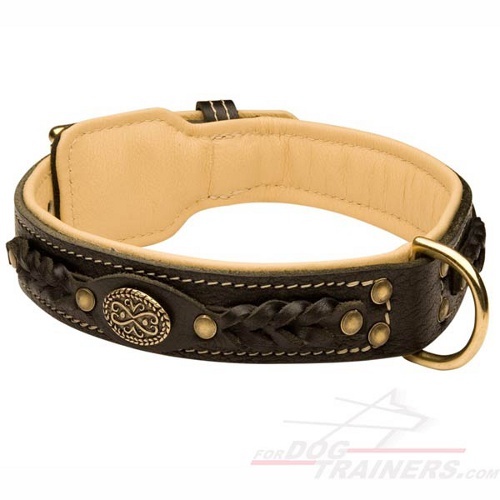 Manufactured of 100% full grain genuine leather, this collar is a real finding. 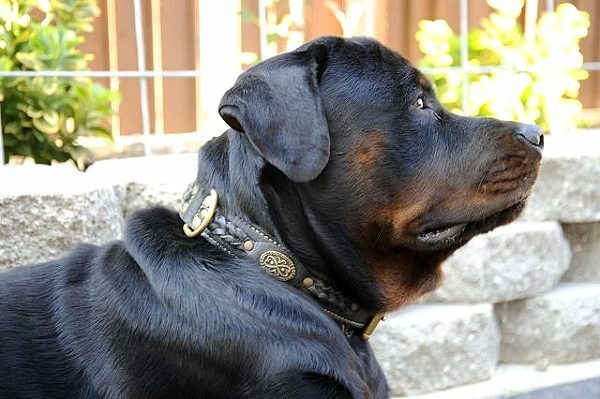 Due to its strength and flexibility, this collar is indispensable every day when you walk your dog! 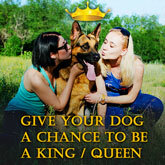 Be confident in your dog! Be confident in his health! 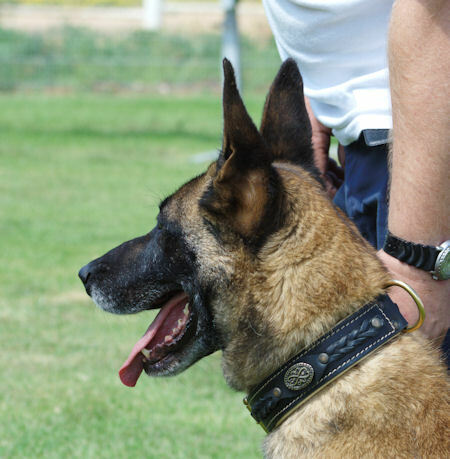 This collar won’t get torn because your four-feet pulls too much. 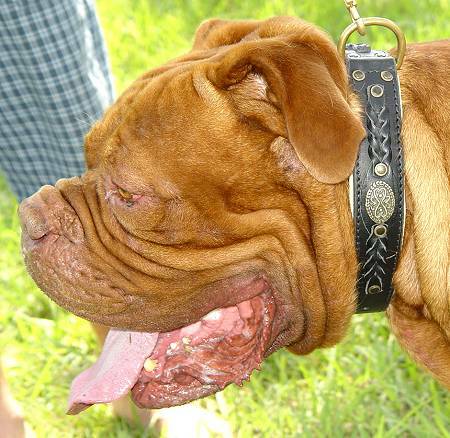 Moreover, it copies your dog’s neck shape so it fits 120% well! Stitched carefully, the edges won’t fray. Besides, it looks awesome, don’t you think so? To diet or not to diet? It is for you to decide! However, if your doggy gained weight, there is no need to throw away his collar and buy a new one as this one is so easy adjustable! Due to the 5 holes with 1 inch distance between each of them you can loosen or tighten the collar when you need it. Soft, smooth, pleasant in touch, beautiful...Nappa leather this collar is padded with! 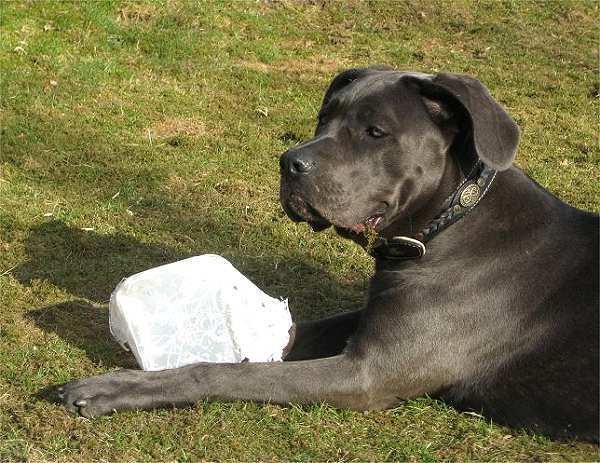 It is the best choice if you want to protect your pet’s skin from rubbing or irritation. It is very important to size your dog properly. For the measurements to be proper, please, take the measuring tape or a thread with a ruler and measure the circumference of your dog’s neck. Thanks for the kind words. Dupree is a great dog. I actually got him from a shelter in Wyoming. 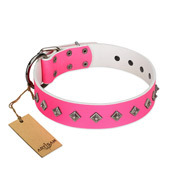 The collar has generated a lot of comments- everyone that sees it loves it. 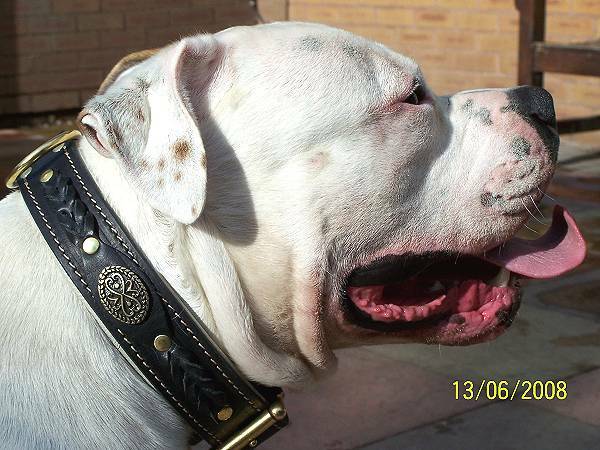 My English Mastiffs new Collar arrived on time in the mail yesterday. 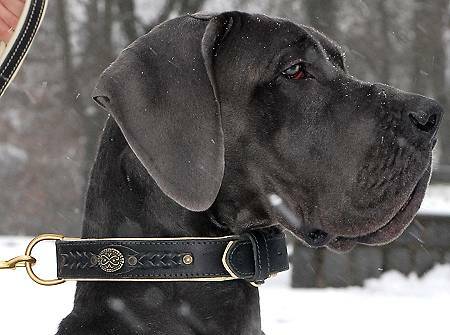 Now I am a picky person and this Collar is absolutely beautiful. 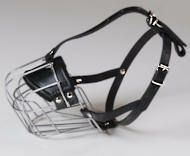 A very well made heavy duty collar. It is so nice I don't want to put it on my Dog till he had a bath. Haha. Thank you very much.